18-year-old Indian sensation overcame mid-match blues to oust Zheng 6-1, 2-6, 6-3 in exciting centre court action in the Tier 4 WTA Tour event. Sania Mirza falls during her match against Jie Zheng at the WTA Hyderabad Open on Wednesday. Top seed Jeevan Nedunchezhiyan will meet sixth seed Vaja Uzakov of Uzbekistan while second seed Vivek Shokeen will face third seed Xiao-Peng Lai of Hong Kong in the semifinals of the SAIL ITF Junior Grade 3 Tennis Tournament. Parasyuk Yulia of Russia in action during the SAIL ITF Junior Grade 3 Tennis Tournament at CLTA Stadium in Chandigarh on Wednesday. Martina Hingis, the former top player on the women's tennis circuit, says she is enjoying life outside the tough world of professional sport and focusing on her private life, which includes England soccer star Sol Campbell. People from the minority community in Jamalpur area of the city today urged the Pakistan Cricket Board to allow its cricket team to play in the city during their tour of India. Muslims flash the victory sign on Wednesday as they urge Pakistan to play their Test match in Ahmedabad. 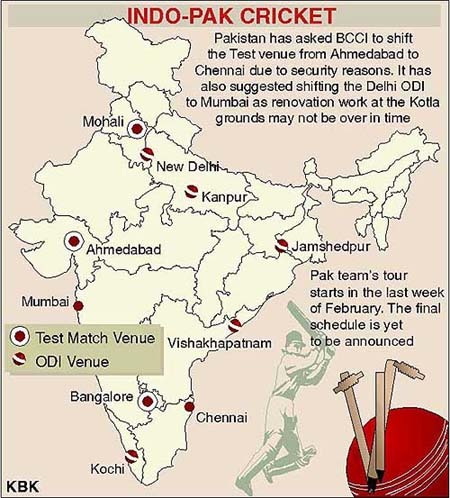 The Pakistan Cricket Board has asked India to drop Ahmedabad as a match venue for the series starting later this month. The finalisation of telecast rights for the India-Pakistan cricket series has been put on hold till next week, BCCI counsel told the Madras High Court today. The BCCI counsel gave an undertaking that it would not finalise tenders or contracts for telecast of cricket matches to be played in the country, including next month’s India-Pak series, till February 17. India ‘A’ whipped India ‘B’ by 90 runs with 13.1 overs to spare to book their berth in tomorrow’s final against India Seniors in the NKP Salve Challenger Series at the Wankhede Stadium here today. I can sense Sachin Tendulkar is causing concern in India. Millions in their homes or offices, classrooms or playgrounds, in beds or little gathering of friends, want to know if he is fit for Pakistan. There is less sympathy for his tennis elbow and more disapproval on how he has gone about it. Coach Bob Woolmer called on Pakistan Cricket Board chairman Shaharyar Khan and tried to convince him that the team was improving with every game and he was optimistic about the upcoming tour of India. The Himachal Pradesh Cricket Association is warming up for a three-day match here with Pakistan though the visiting team is yet to confirm it will play. A three-day match is scheduled in Dharamsala against the Board President’s XI when Pakistan tours the country. Shashank Shekar, an executive member of the Himachal Pradesh Karate Association, has accused the Pune-based National Karate Federation of India of misappropriating about Rs 37,000 on the pretext of sending a student of Dagshai Public School as a participant in the 4th World Junior Karate Championship. DAV College, Jalandhar, will meet Faculty of Social Sciences, Jamia Millia Islamia, in the final of the 12th ONGC-Nehru Champion Colleges Hockey Tournament at the Shivaji Stadium here tomorrow. Mohun Bagan laboured to a 1-0 victory against JCT Mills in the seventh round tie of the ninth National Football League at the Salt Lake Stadium here today. Mohun Bagan now have 10 points from seven outings while JCT are on seven from seven. Sania Mirza scored an upset victory over Chinese fourth seed Jie Zheng to storm into the quarterfinals of the Hyderabad Open tennis tournament here today. The 18-year-old Indian sensation overcame mid-match blues to oust Zheng 6-1, 2-6, 6-3 in exciting centre court action in the Tier 4 WTA Tour event. This would be her first quarterfinal appearance at this level of an event. The Hyderabad girl would face a comparatively easier opponent in Israel’s Tzipora Obziler, the world number 115 and unseeded here, who earlier in the day, brushed aside Evie Dominikovic of Australia 6-3, 6-2. Sania started off in a fiery fashion, demolishing her Chinese opponent 6-1 in the opener. Egged on by a partisan, boisterous home crowd, she took a commanding 5-0 lead in the opener, coming out with exquisite cross-court smashes that left Zheng rooted to the ground. But things started going wrong for Sania in the second set, as Zheng, who was the first Chinese to reach a Grand Slam fourth round at Roland Garros last year, regained ground and sought to assert her supremacy. As her opponent saw a dip in consentration, Zheng capitalised on her lapses, forged ahead, and won the second set 6-2. Sania started the decider on a strong note, breaking Zheng in the first game, and then made it 2-0. Zheng then held on to her serve in the third game. Thereafter Sania gained the upper hand and played some superb groundstrokes to put it across her fancied opponent. In another match, Alyona Bondarenko of Uktraine scored a hard-fought 6-3, 6-7 (2/7), 6-4 win over Hungary’s Melinda Czink to enter the quarterfinals. China’s Tian Tian Sun upset sixth seed and former champion Tamarine Tanasugarn of Thailand 6-2, 6-1 to storm into the quarterfinals. The 23-year-old from Beijing had no difficulty in disposing of world number 67 Tanasugarn, who failed to put her act together. Sun was in total command and never allowed her opponent, winner of the first edition here in 2003, to stage a comeback. Sun would meet second seed Anna-Lena Groaenfeld of Germany, doubles partner of tennis legend Martina Navratilova. The German won 6-3, 6-2 against Slovakian qualifier Jarmila Gajdosova. Unseeded Tzipora Obziler of Israel also cruised into the last eight with an identical 6-3, 6-2 win over Evie Dominikovic of Australia. Tennis legend Martina Navratilova and German Anna-Lena Graenefeld had little trouble in thrashing the Japanese pair of Shiho Hisamatsu and Remi Tezuku to move into the second round. Top seed Jeevan Nedunchezhiyan will meet sixth seed Vaja Uzakov of Uzbekistan while second seed Vivek Shokeen will face third seed Xiao-Peng Lai of Hong Kong in the semifinals of the SAIL ITF Junior Grade 3 Tennis Tournament. Jeevan had an easy 6-2, 6-1 win over Christan Hodel of Romania while Vivek downed eighth seed Agung Bagus Dewantoro of Indonesia 7-5, 6-0 here today. Third seed Xiao-Peng Lai of Hong Kong defeated unseeded Stas Zhuraski of Russia 6-2, 6-4. In the girls’ section, top seed Sandhya Nagaraj of India and second seed Xeniya Palkina of Kyrgyzstan were outplayed by their opponents. Third seed Madura Ranganathan of India was still in the fray. Sandhya disappointed Indian fans when she was defeated by Laura Loana Andrei of Romania in straight sets 7-5, 6-3. Results: boys’ singles (quarterfinals): Jeevan M. Nedunchezhiyan (Ind) b Christian Hodel (Rom) 6-2, 6-1, Vivek Shokeen (Ind) b Agung Bagus Dewantoro (Indonesia) 7-5, 6-0, Vaja Uzakov (Uzb) b Faisal Aidil (Indonesia) 6-2, 6-1, Xiao-Peng Lai (Hong Kong) b Stas Zhuravski (Rus) 6-2, 6-4; Girls’ singles (second round): Andrei Laurqa Loana (Rom) b Sandhya Nagaraj (Ind) 7-5, 6-3, Else Potgieter (RSA) b Parija Maloo (Ind) 6-3, 6-2, Amina Rakhim (Kaz) b Iryna Khatsko (Ukr) 6-2, 6-1, Dilyara Saidkhodjaeva (Uzb) b Goele Lemmens (Bel) 6-3, 6-4, Yanina Wickmayer (Bel) b Daira Bykodarova (Rus) 6-2, 6-2, Madura Rangarajan (Ind) b Ofelya Poghosyan (Arm) 6-2, 6-0, Martina Lautenschlager (Sui) b Yulia Parasyuk (Rus) 6-2, 1-6, 6-4, Mariya Malkhasyan (Ukr) b Palkina Xeniya (Kgz) 6-6 (4), 2-6, 6-3. Boys’ doubles (Ist round): Vivek Shokeen and Jeevan Nenduchezhiyan (Ind) b Fariz Mohammed and Nityaesh Natraj (Ind) 6-0, 6-1, Lai Xiao-Peng and Ronald Chow (HK) b Rikus Devillers and Brad Brinkhause Williams (RSA) 6-2, 6-3, Kaushik Das (Ind) and Neil Rajpal (Canada) b Akash Wagh and Navaneetha Kannan (Ind) 7-6 (5), 3-6, 6-3, Vaja Uzakov (Uzb) and Stas Zhuravski (Rus) b Ayrton Wibowo and Aidil Faisal (Indonesia) 6-2, 6-3, Agung Bagu Dewantoro and Christoper Runkat (Indonesia) b Christian Hodel (Rom) and Beidas Bassan (Leb) 7-6 (1), 6-1, Kinshuk Sharma and Tariq Jacob (Ind) b Rajkanwar Singh and Shiva Sangwan (Ind) 6-1, 4-6, 7-5, Krishna Karsolia and Alapati Siddharath (Ind) b Navinder Pal Singh and Honey Rana (Ind) 6-1, 6-4, Sumit Parkash Gupta and Kaushik Raju (Ind) b Ned Boone (GBR) and Indrei Plotnyi (Rus) 7-5, 7-6 (7). Hingis, who played her first competitive match since 2002 last week in Pattaya, Thailand, said in an interview published yesterday with the weekly magazine Schweizer Illustrierte that she has no plans to return full-time to the tour, but will continue to play in exhibition matches and charity events. "I have a very good life and enjoyed all the freedom over the last two years," the 24 year-old Swiss said, according to the magazine. "I am no longer 16 or 17, and I am no longer prepared to concentrate solely on world class sport." Hingis, who lost February 1 in her comeback bid against German Marlene Weingartner 1-6, 6-2, 6-2, said she was surprised by how much women's tennis had developed in her absence and that it would be difficult for her to compete with the new athletes dominating the sport. "What was good enough two years ago, doesn't do it anymore. Now, my size puts me at a disadvantage," she said. Quizzed over her rumoured relationship with Campbell, 30, Hingis said she enjoys the company of the England and Arsenal central defender. But, pressed by the magazine on whether Campbell is her "new love," she said, "That's too strong a word." "I like Sol a lot and we see each other whenever possible, but he has many matches and I have my appointments as well," she said. "It is not easy for us both." Hingis and Campbell reportedly first met at a gala gathering hosted by the United Nations in London in December. Both are goodwill ambassadors for the world body. Hingis reportedly broke up that month with Stean Egger, a Swiss sports entrepreneur and restaurant owner. Other previous boyfriends have included Spanish golfer Sergio Garcia and Florida Assistant State Attorney Cristopher Calkin, who in 2001 successfully prosecuted a man who had stalked Hingis at her home and at tournaments around the world. People from the minority community in Jamalpur area of the city today urged the Pakistan Cricket Board (PCB) to allow its cricket team to play in the city during their tour of India. Holding placards and shouting slogans, the people claimed the city was “peaceful”. 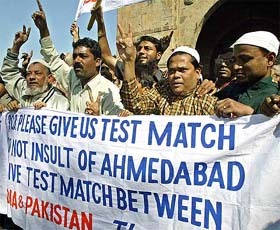 “Ahmedabad has been peaceful for over two years now and the Pakistan cricket team should have no fear for playing in Ahmedabad,” the placards carried by some of the 60-70 people gathered said. Shiv Sena chief Bal Thackeray has come down heavily on the Board of Control for Cricket in India (BCCI) for inviting the Pakistan team to play in the country. He alleged that a few office-bearers of the BCCI were trying their best to get the Pakistan team here. He was reacting to reports that Pakistan Cricket Board (PCB) chief Shaharyar Khan had expressed willingness to play a match in Mumbai, if invited by the BCCI. The finalisation of telecast rights for the India-Pakistan cricket series has been put on hold till next week, BCCI counsel told the Madras High Court today. The BCCI counsel gave an undertaking that it would not finalise tenders or contracts for telecast of cricket matches to be played in the country, including next month’s India-Pak series, till February 17. The assurance was given when a petition filed by Zee Telefilms Ltd, challenging a September communication last year cancelling the contract bagged by the firm for telecasting cricket matches to be played in the country for the next four years, came up for hearing today. Recording the undertaking, Justice K P Sivasubramanian directed the BCCI, former Board President Jagmohan Dalmiya and ESPN-Star Sports (ESS) to file their counter affidavits by February 14. On February 2, a five-member Constitutional Bench of the Supreme Court, while dismissing a writ petition filed by Zee challenging termination of the contract, had said that the TV firm could move the Madras High Court for relief. Appearing for Zee, Senior Supreme Court advocate Harish Salve moved the petition filed under article 226 of the Constitution, seeking to quash the cancellation order and restraining the BCCI from awarding telecasting rights till August 7, 2008 to any other provider. He alleged that the contract was cancelled to favour ESS and prevent Zee, an Indian company, from acquiring the telecasting rights for the period October 1, 2004 till August 7, 2008, which included last year’s home series against Australia and South Africa. He said when the tenders were opened it was found that his client’s bid of $ 260 million (approx Rs 1200 crore) was the highest and claimed that the BCCI instead of asking Zee if it could increase the amount had told ESS to raise its bid and then asked Zee if it was prepared to match the amount. Salve said his client quoted $ 308 million, which was accepted by the TV Rights Committee of the BCCI, and told to pay $ 20 million within 48 hours and the payment was made by Zee on September 7, 2004. India ‘A’ rode on skipper Rahul Dravid’s splendidly compiled 96-ball 115 to pile up an imposing total of 294 for 9 in 50 overs. It set their rivals a stiff asking rate of 5.9 to win the match. But India ‘B’ were unequal to the task despite the presence of stalwarts Virender Sehwag, the team skipper, who batted at two down, and one down batsman V.V.S. Laxman and collapsed for 204 in only 36.5 overs. Left-arm spinner Murli Kartik bowled a fine opening spell of five overs, in which he sent back opener and top scorer Robin Uttapa (66 of 48 balls with 12 fours) and Rohan Gavaskar. He later bowled five balls to add another victim to his kitty and finished with fine figures of 3 for 26. Fall of wickets: 1-13, 2-35, 3-73, 4-197, 5-231, 6-259, 7-259, 8-265, 9-293. Bowling: Nehra 10-0-43-3, Bhandari 9-0-49-1, Sharma 10-0-56-1, Sehwag 9-0-59-2, Powar 7-0-50-0, Gavaskar 5-0-32-1. Fall of wickets: 1-22, 2-98, 3-129, 4-143, 5-152, 6-172, 7-178, 8-191, 9-193. I can sense Sachin Tendulkar is causing concern in India. Millions in their homes or offices, classrooms or playgrounds, in beds or little gathering of friends, want to know if he is fit for Pakistan. There is less sympathy for his tennis elbow and more disapproval on how he has gone about it. All questions on technique and temperament, style and method are shot at him. The revisionists are questioning his place in history. Injuries you can never tell. The years logged on are reflected in a weary frame. Much as we hope against, we still age. A quick-fix and the show moves on. There is no sense in blaming Tendulkar if he rushed his return in order to feast on Bangladesh. He couldn't have done it without encouragement from doctors. I am in his corner. It is stupid to blame his heavy bat or bottom-hand grip for his distress. I mean he would soon have the most Test runs and centuries more than anyone else in history. All those one-day hundreds. He can't bat with two more hands. Rubbish, utter rubbish. Give me a break. There is still more whining: he is no longer dominant. But people change, experience factor gets in. If that's the way he sees it, that's the way it is. Sometimes you can't any longer do those things. Body is not in the best of shape. It doesn't listen to your mind. Having been a cricketer, let me sense this young man's mind: Oh, I am injured now, let me lay off for a while, recover and then produce the same passion and freedom. Play on while I recover and then bring on the magic. It could well be the lull before the Tendulkar storm. You then moan that he is not a good finisher of matches, like Brian Lara has been at times, and hasn't won India many games. But then Tendulkar handled the pressure when it was most required in the course of a match. He can't do much if your fast bowlers lack firepower. I have always felt India has been lacking in this department. Revisionists feel he hasn't turned out to be the Viv Richards he once promised. They wonder if he has the tenacity of a Sunil Gavaskar and the style of a Brian Lara. Batting Gods like Sir Donald Bradman and Garfield Sobers are brought into the equation. It is being made to look as if Tendulkar has faced any lesser bowling than we did in our times. Today you still have the likes of Shoaib Akhtar and Brett Lee in the field. Steve Harmison was captivating in the West Indies. Irfan Pathan is wonderfully aggressive and came up with good scalps in Australia. Guys are consistently trying to bowl as fast as they can. There are Murali, Shane Warne and Anil Kumble. Batsmen are scoring runs and at a fast clip. It's a fair quality. There is a better technology, the game has moved along scientific lines. Individuals are mapped better, there is a blueprint for each batsman and bowler. Chinks are honed in and then exploited. You can always speculate if Tendulkar would have faced Roberts and Holding, Croft and Garner, Marshall and Clarke with same aplomb as Gavaskar did. 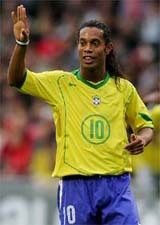 But any class player of any era would have come to grips with it. Gavaskar did it. Tendulkar wouldn't have been short on it. The bowlers Gavaskar played against were the best quicks in the world. While others were cowering under the fear-factor, Sunny was successful and produced a chain of centuries against the pack of wolves. I have some sentiments about Sunny but Tendulkar is very fresh and attacking in style. He is still lord of the manor, still makes his contribution, enjoys his cricket and be in the limelight. He has provided a leadership role to the likes of Virender Sehwag, Gangulys and Dravids. That's the Tendulkar hallmark. That was of Little Master as well. They have passed on their contribution in the manner they gave confidence to others. It went beyond runs. India has been a better team because of it. The thing about batsmanship is the inspiration it provides to future generations. Bradman did it. Everybody who looked back in the past, took him as a model. Don represented it. He was the best cricketer playing in his era. He inspired the coming generations. The same is true with top batsmen of all eras. There have been so many of them. Among openers Gavaskar, Desmond Haynes. Geoff Boycott brought his own value to things. Ricky Ponting at number three, Tendulkar, Lara, Damien Martyn, there are so many of them. I don't like naming my favourite World Eleven because I prefer options. If there are no options, it means you are desperate and nobody likes being in such a situation. Even for my car, I prefer two keys! I have the same reasoning for teams. Often I am asked to compare the modern-day Australian team with the West Indies of 80s. How we would have fared against each other? We would never know and can keep speculating. I would have loved the opportunity and the Australians would be saying the same thing. It's like being in the boxing ring: Once inside, you expect to win: you don't let the other guy beat you. It is a challenge which is inviting to me and to a lot of other guys. “Woolmer told the chairman that the team was improving with every game and was optimistic about the forthcoming tour,” sources close to Shaharyar said. Woolmer, however, expressed concern over the fragile top order, which he believed was the root cause of their debacle Down Under. “But his only concern is the top order failure that, according to him, was the root cause of Pakistan team’s failure in the VB Series final against Australia,” the sources said. During the meeting, which Woolmer described as “productive” before leaving for South Africa, the coach gave his viewpoints on various issues on the recent Australian tour and the forthcoming visit to India, besides discussing other cricket-related matters. “Basically, Woolmer gave his views on the just-concluded Australian tour and also gave his mind on the team combination for the forthcoming Indian tour,” they said. “The meeting was cricket-related, but yes, they discussed a couple of other issues also,” the sources added, without elaborating those issues. The England-born South African, Woolmer, felt that although the team did not win the Test or one-day series in Australia, the team’s performance was neither disappointing, nor poor, as it was being said and reported. The Himachal Pradesh Cricket Association (HPCA) is warming up for a three-day match here with Pakistan though the visiting team is yet to confirm it will play. A three-day match is scheduled in Dharamsala against the Board President’s XI when Pakistan tours the country. And the HPCA is busy decking up the cricket stadium for the first international match here. HPCA president Anurag Thakur said preparations are on in full swing. He denied reports that the Pakistan Cricket Board had raised concerns about “altitude fatigue” in Dharamsala. “Dharamsala is only 3,500 feet above the sea level and no one should have any problems. We are hoping for a good match,” Mr Thakur said. He said the Board of Control for Cricket in India (BCCI) had sent no communication about the venue being changed. “There is no question of a change. We are awaiting the formal dates for the three-day match,” Mr Thakur said. Shashank Shekar, an executive member of the Himachal Pradesh Karate Association (HPKA), has accused the Pune-based National Karate Federation of India (NKFI) of misappropriating about Rs 37,000 on the pretext of sending a student of Dagshai Public School as a participant in the 4th World Junior Karate Championship. Shekar claimed that he had deposited Rs 50,000 with Raju Thapa, general secretary and technical director of the NKFI, for registration, entry, training, lodging and boarding fees of a student selected for the championship that was scheduled to be held at Darmstadt, Germany, from October 22 to 24, 2004. As per documents available with The Tribune, on September 9, 2004, Rahul Sood, secretary general of the HPKA, had informed the school Principal about the selection of Upjeet Singh Cheema for the championship. Four other students from the state were also selected. As per the terms and conditions mentioned in the HPKA letter, the total expenses for participation in the championship were Rs 85,000, of which Rs 25,000, along with the passport, were to be deposited with the NKFI before September 15, 2004, for obtaining visa. The HPKA has passed on the information received from Raju Thapa through a letter dated September 7, 2004. Only Upjeet Singh had confirmed his participation in the championship. A demand draft of Rs 25,000 dated September 15, 2004, was sent to the NKFI along with a photocopy of Upjeet’s passport and three passport size photographs. Later, Rs 30,000 were demanded for obtaining visa and air ticket of Upjeet Singh. The amount was handed over to Hem Raj Thapa, younger brother of Raju Thapa, at New Delhi by a representative of Shekar on October 5, 2004. Raju Thapa had given a handwritten receipt of Rs 30,000. All amounts were paid by the parents of Upjeet Singh on the behalf of Shekar, who was also a senior accountant and office superintendent of the school. 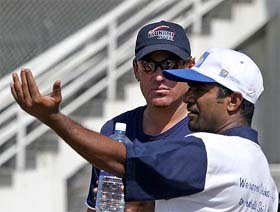 In a letter dated October 10, 2004, Raju Thapa informed Shekar that the venue of the championship had been changed from Germany to Great Britain. As per this letter, the revised total expenses for participation in the championship were Rs 1 lakh. However, despite getting Rs 55,000, the NKFI did not inform him about the venue and schedule of the championship, Shekar alleged. He claimed that after repeated phone calls, he was informed that the championship had been cancelled and the amount received would be refunded soon. A sum of Rs 7,000 was paid for the cancellation of the ticket of Upjeet as asked by Raju Thapa. Shekar said he had gone to New Delhi several times and made STD calls to Thapa to get information about the refund of the deposited money. The NKFI had refunded Rs 25,000 through a demand draft in the first week of November, 2004. On November 20, Shekar met Thapa during the National Karate Championship at Jammu, where the latter again expressed his inability to refund the amount. Shekar claimed that he had to give Rs 55,000 to Upjeet’s parents from his own pocket. Shekar had served a legal notice on Thapa and the NKFI in December, seeking the recovery of Rs 42,000, including Rs 5,000 spent by him on STD calls. Meanwhile, Raju Thapa has denied the allegations. When contacted on the phone at Pune, Thapa said due to lack of funds he could not refund the balance amount. “We had planned to refund the money after organising the National Karate Championship at Shimla this year. The championship was to be cancelled as Rahul Sood had left Himachal Pradesh without informing the NKFI,” he said. The money would be refunded within a month, he assured. Efforts to contact Rahul Sood went in vain. In the semifinals here today, DAV College, Jalandhar, defeated St Stephen’s College, Bangalore, 7-3 while Faculty of Social Sciences, Jamia Millia, defeated Faculty of Humanity and Social Sciences, Varanasi, 2-1. In a high-scoring match, the Jalandhar college started their scoring spree in the first minute when Ravinder Singh hit the mark. Two minutes later, Harjit Singh enhanced the lead while Major Singh made it 3-0 in the ninth minute. A minute later, Cariappa pulled off a goal for St Joseph’s to reduce the margin 1-3, but Major Singh struck again to enhance the winners’ lead to 4-1 in the 16th minute and Harjit Singh scored the fifth goal in the 21st minute. Four minutes before half time, Varun Ponaippa reduced the margin 2-5, converting a penalty corner. On resumption, Major Singh and Gurpreet Singh added a goal each to bulge the winners’ lead while Ponaippa completed his brace to make the score 3-7 for the losers. In the other match, Kuldeep Singh and Pramod Kumar Singh scored the goals for Jamia Millia while Arun Pratap Singh slotted home the consolation goal for the Varanasi college. Mohun Bagan laboured to a 1-0 victory against JCT Mills in the seventh round tie of the ninth National Football League at the Salt Lake Stadium here today. Mohun Bagan now have 10 points from seven outings while JCT are on seven from seven. Mohun Bagan shot into the lead 18 minutes into the game. Noel Wilson let go a long ranger that ricocheted off the cross piece into play. Ashim Biswas standing close by headed the ball to the far corner of the net rendering JCT keeper Mansuru Mohammed a mere spectator. JCT got a golden opportunity to restore parity at the stroke of 90 minutes when Chiranjeet Kumar led the ball beautifully for Ram Paul with goalkeeper Bibhash Ghosh hopelessly out of position. However, Ram Paul balloned the ball over the bar with an empty net staring him in the face. MARGAO: A second-half goal by Sebastiano Endro enabled debutants Fransa Football Club to stop Federation Cup champions Dempo Sports Club’s unbeaten run and record a shock 1-0 win in the seventh round of the National Football League here on Wednesday. The all-important goal for Fransa came in the 69th minute, which ultimately turned out to be the match-winner.